1. Place the broad beans in a heatproof bowl. Add a kettle of boiling water and set aside. 2. Spray a frying pan with oil and stir-fry the pork over a medium heat for 3-4 minutes until browned. 3. Drain the beans and add to the pan with the risotto. Cook for 8-10 minutes until piping hot. Frozen risotto is an excellent last-minute kitchen standby. 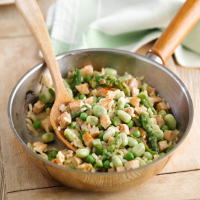 Look out too for the delicious Waitrose frozen seafood risotto which contains 341 calories in a 300g serving.